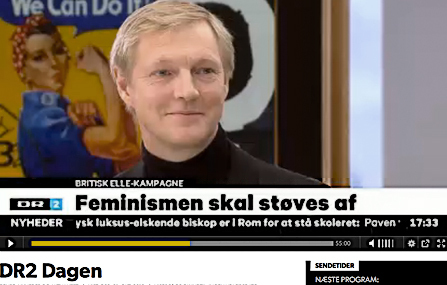 2013-10-21 Erik Hansen-Hansen in Danish TV ‘DR2 Dagen’ on the subjects of feminism branding in British Elle and different feminist ideologies, e.g. hedonist feminism versus radical feminism. Hosts were Jakob Illeborg and Lene Johansen. Weblink to TV broadcast here, starts at 25:00.